Breakpoints are arguably the most used feature in the process of debugging. As their name suggests, they are literally a point where the execution of your program will break, or more precisely, will pause. 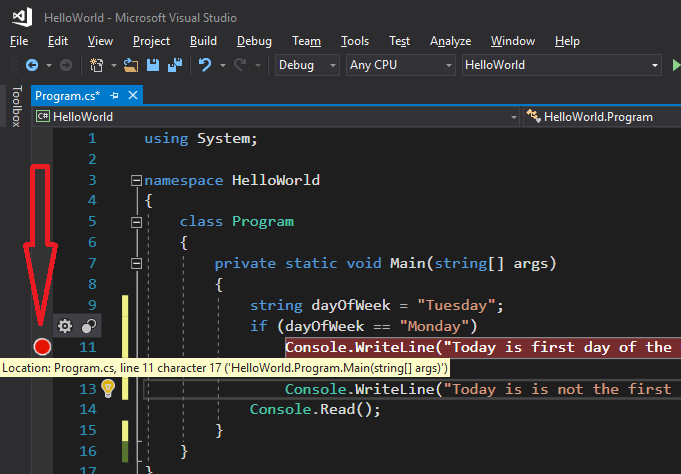 Whenever the execution of a program is in this paused state, which isn’t design time, but it’s neither runtime (you could say it is an intermediary between these two states), we say that the program is in debug time, or debugging mode. Another way of doing this is by placing the cursor on the line where you want to set up your breakpoint and going to the Debug menu and choosing the Toggle Breakpoint option, or by simply pressing F9 on your keyboard. 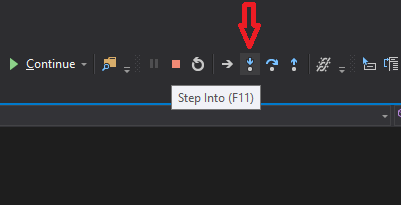 To disable a breakpoint, you can simply click on the red circle with your mouse, or press F9 again while the cursor is on the specified line of code. If we go to the console window again, we can also see that it is empty. Nothing was printed. And it is also not responding to our interactions, no matter how many keys we press. This means that the Console.Read(); part is not doing it’s job! And why didn’t it print “Today is not the first day of the week!”? The fact that the red circle has a yellow arrow on it indicates that that’s the point where the execution was paused, or, as programmers say, “where it hit the breakpoint”. In simple words, since dayOfWeek was initialized as “Tuesday”, when we checked it to see if its value is “Monday”, that condition returned False, and the execution was transferred to the Else part. And since we placed a breakpoint at that part of the code, when the execution was transferred to it, the breakpoint was hit and it paused the execution of the program. We are now in debugging mode. Since the phrase was not yet printed on the screen, this also means that when a breakpoint is hit, the yellow arrow indicates where the execution paused, in other words, what’s the next code to be executed when the program execution resumes. This is the reason why the phrase was not printed on the console, that instruction will be the first following when the execution resumes. Also, the reason why Console.Read(); was not executed is similar: that part of the code was not yet reached, it is yet to be executed. The fact that our program is in a paused state also explains why the console window doesn’t respond to our interactions. So, what can we do in this debugging state? OK, we saw that we can test whether a certain line of code is executed or not. But, that’s it? Another beautiful thing! 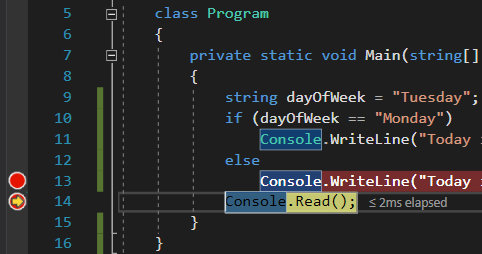 Visual Studio lets us know the result of our conditional checks! 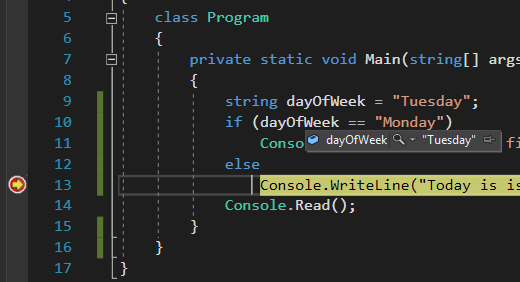 It indicates that the condition dayOfWeek == "Monday" was False when the execution reached it, and that explains why the Else part was executed. But trying to press any key would still be in ignored. 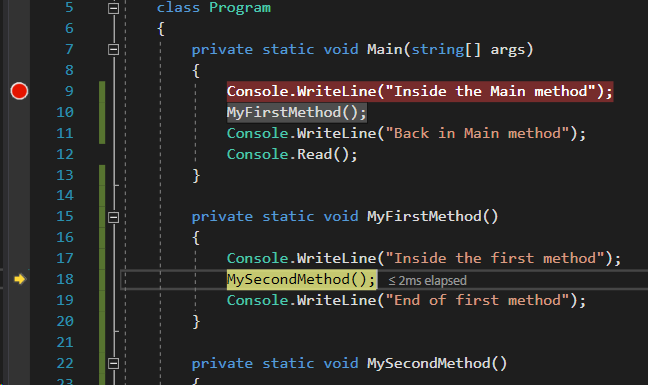 The line that was printed appeared because when we clicked on Continue, Visual Studio executed the next codes that were following after the point where it was paused, until the new breakpoint paused it. 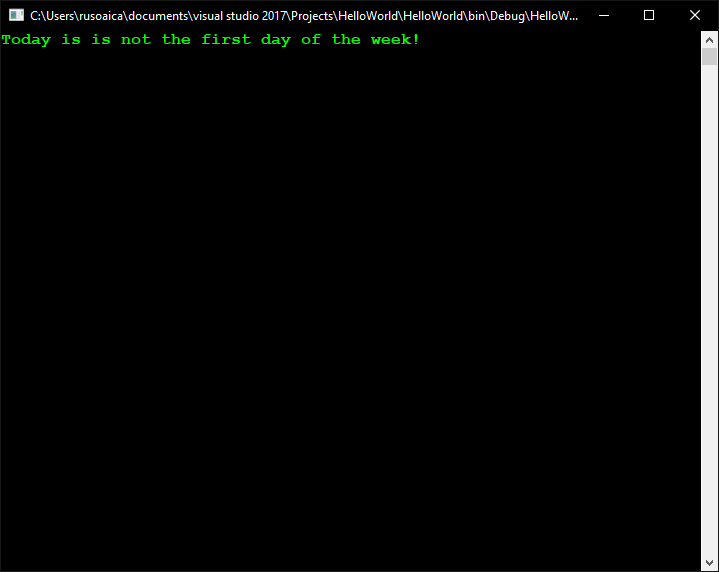 In other words, it executed the Console.WriteLine("Today is is not the first day of the week! "); line. 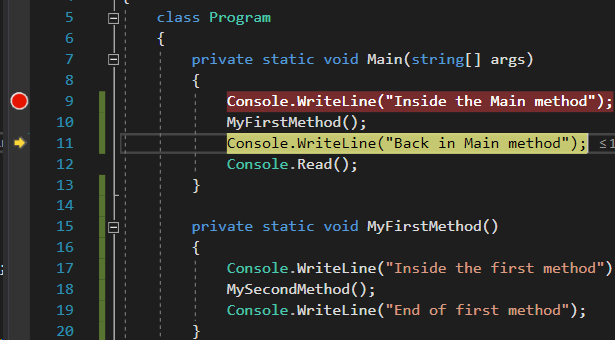 Press Continue again, and you will see the console window restoring to front and none of our breakpoints with yellow arrows on them, while the Continue button reverted to being grayed out. All these indicate that we are back in runtime mode. If you want, you can check this by pressing any key, followed by Enter. 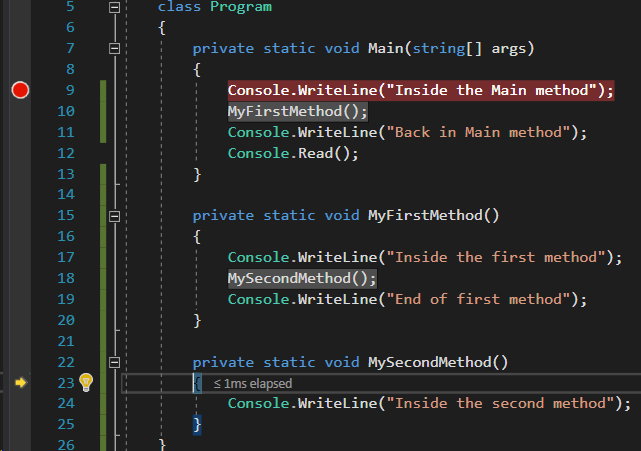 Console.Read(); line should now do its job and the window will close. Stop the execution. Delete the breakpoints by going to the Debug menu and choosing Delete All Breakpoints. 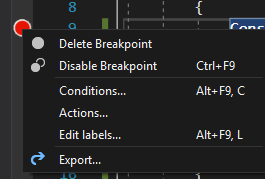 You can always use this option to clear up your numerous breakpoints, but be aware that it will delete all the breakpoints in the entire project. So, pay attention, if you have some set in other files. If we hover our dayOfWeek variable again, we will now see that it has the “Tuesday” value assigned. This means that the execution resumed, executed the line where the value received its value, and then paused again, advancing a single line. 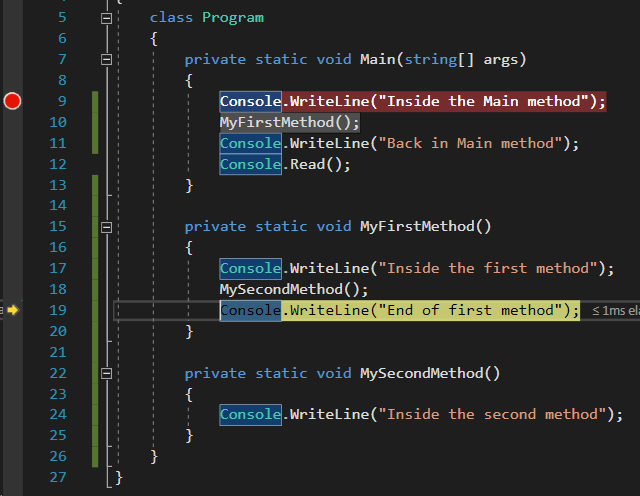 No need to manually set a breakpoint on the next line, when we can execute next lines one at a time, using this button. If you expected it to advance on the next line, you were partially wrong. Only partially because it indeed jumped on the next line, but on the next line to be executed according to the logic of our program. Since the line that was executed was a conditional check, it calculated its result, and advanced the execution to the first line that followed according to that conditional results. Since we checked if dayOfWeek is “Monday”, but it was “Tuesday”, the execution jumped on the Else block, not the If one. 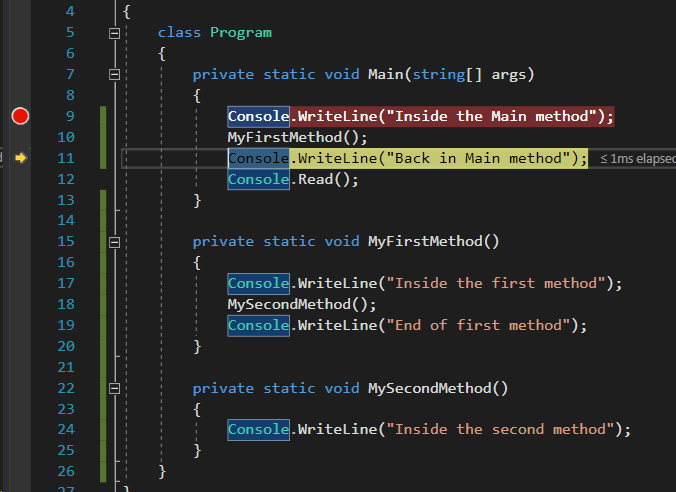 With this, we realize that we can use this Step Into button to follow the execution path of our programs, see which lines are executed, which are ignored, etc. You wouldn’t normally need to do this, but there are cases where you want to test how some codes that would not be hit under the current conditions behave. Who knows? 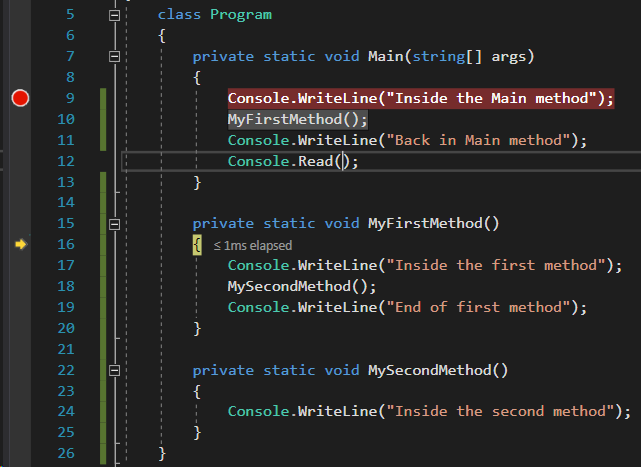 Finally, you can even drag the arrow downwards, making the compiler skip executing some of the lines. We can even drag it to the ending curly bracket of the Main() method, skipping the execution of all the code left inside its block! This feature could prove to be very useful in certain situations. I only need to think of one scenario where this could be critically important: if you were working in a nuclear power plant and you were debugging the codes that would trigger the shut down of the core, would you really shut it down when the execution reaches that part? No, we only need to test that the conditions that trigger the shut down are met and the execution actually gets there. After that, we can simply skip the code that would really shut it off. The If block was executed now, because we changed the value of our variable to “Monday”, and now the conditional check returns True, thus executing that particular block of code. As you can notice, there are a few other buttons near the Step Into one, namely: Show Next Statement, Step Into, Step Over, Step Out. Let’s analyze a bit deeper what they all do. Show Next Statement is quite simple. It highlights the next statement that will be executed when the execution resumes. and see that the execution was transferred back to the Main() method. In other words, if we used Step Into to go one level deeper inside a function call, if we pressed Step Out while inside its body, the execution will be returned to the point where that method was called. As a conclusion, using a combination of Step Into and Step Out can help us peek inside the methods that are called in our codes, and quickly return to where it were, if it was not what we were looking for. We can already imagine what Delete and Disable Breakpoint do. They are self descriptive. 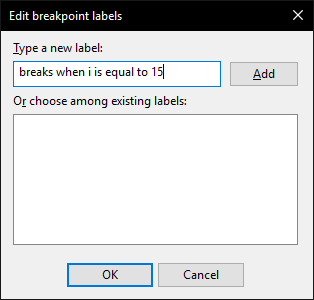 The last options, Export, is also intuitive: it lets us export breakpoints as XML files which can later be imported, to have the same breakpoints set up again. This indicates that the breakpoint is an advanced breakpoint, in this case, one that will be hit only when the condition we specified will be hit. Run the program. The execution will stop at our breakpoint, and if we hover with the mouse cursor over the variable i, or if we go to the Locals tab, we will see that the current value of i is 15, just as we specified as condition for the breakpoint. You should already see how this could be useful to us, to be able to set out breakpoints that will pause the execution of our programs only when certain condition we want to specify are met or not met, if a certain variable’s value changes, and a lot of other options that you should check out for yourselves. Similarly, Actions would allow us to perform an action, and notice that we can combine Conditions and Actions together, for more control. With this, we conclude the lesson about breakpoints. In the next lesson we will learn about the Stack and the Heap memory areas, what they are and how they can help us. This entry was posted on Wednesday, August 8th, 2018 at 23:35 and is filed under Debugging And Error Handling. You can follow any responses to this entry through the RSS 2.0 feed. You can skip to the end and leave a response. Pinging is currently not allowed. Posts (RSS) and Comments (RSS). 508 interogations. 0.904 seconds.